Best Tips In Maintaining The Serenity Of Any Commercial Place. The Saying, “First Impression is the last impression” holds great importance in the corporate world. Be it a new candidate for hiring or a potential client, the working condition of the business and the work environment play a crucial role in building goodwill for the business. The best working condition is the one which is clean, hygienic and does not suffocate the employees. Every organization should concentrate on providing their employees with a healthy working environment. Doing so will enhance their work efficiency and make the office environment happy and refreshing. We at Drainvac Central Vacuums have enlisted a few ways how an organization can keep the environment and ambiance of the office clean, hygienic and refreshing. Used papers, wrappers, and other littering things can make a mess in the office. 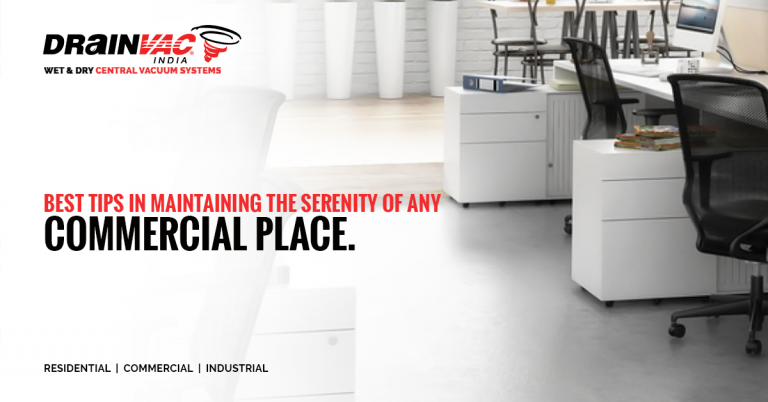 Keeping trash cans at every accessible location ensures that the office surroundings remain clean and fresh. All the employees should be strictly instructed to not litter around and maintain the decorum of the working space. A commercial organization should also consider making rules and regulation regarding basic hygiene and cleanliness so that professionalism at work is maintained and leaves a lasting impression on the visitors and the clients. Cleaning and maintenance of the working space should be done regularly. For this purpose, the office management should introduce a proper timetable for dusting and cleaning, so that the working employees are aware of this schedule and adjust their tasks accordingly. Such schedule help maintain the discipline and does not waste valuable working hours. The management can either choose a time prior to the working hours or afterward so that the office is empty and there is no disturbance to anybody. The best way to get a job done properly is to assign it to a professional. Organizations should inculcate the practice of hiring only professional housekeeping staff to ensure that the work is done properly with no reason to complain. If you are worried about your budgets shooting up because of outsourcing a professional staff. Drainvac has an option for you – The Central Vacuum Cleaning System. A powerful system that will give you deep cleaning of your office at the cost much lesser than that of outsourcing a professional staff. All you have to do is to install the centralized vacuum cleaning system just like you install your electric wiring or the centralized air-conditioning system. The vacuum cleaners are easy to handle and do to not need any special training to use. Once the system is installed you do not have to worry about is ever again. You can keep the main unit of the vacuum cleaner in one place and use the portable units to clean every corner of the office without disturbing the office staff and wasting their valuable time. Get the powerful centralized vacuum cleaning system and ensure the cleanliness and hygiene of your office, Contact The Experts at Drainvac Central Vacuums today!